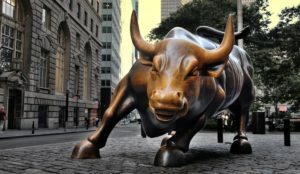 Home > Market News > Can Anything Stop the Bull? Can Anything Stop the Bull? As we mentioned a couple weeks ago, oil markets have shown strong bullish sentiment despite an array of bearish headwinds – suggesting that Iran sanctions are overwhelming any other market factor. Traders are increasingly making the bet that crude will go to $100 by the end of the year, with call options on $100 December crude rising 30% in the last week. For fuel prices, that could mean an additional 60 cents by the end of the year. 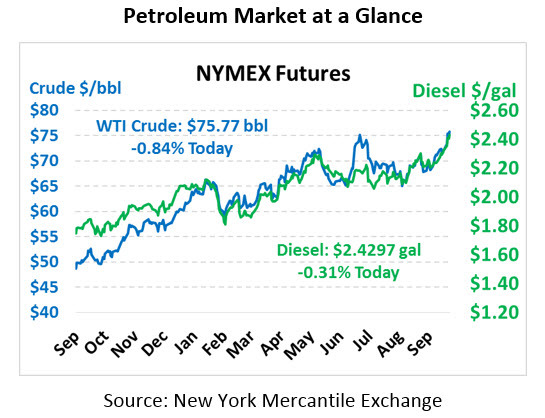 Back in July, we took a poll of FUELSNews readers asking whether WTI crude would hit $80 or $60 next. Although we’re still waiting on the final answer, the 63% who answered $80 are certainly gaining confidence this week. So now, with prices around $75, we’re asking an even more daring question – will crude hit $100 next, or $50? One suggests a strongly bullish market from here, while the other would indicate an extreme reversal in prices, a return to the supply glut we saw in 2015-2017. Are you willing to take the bet? 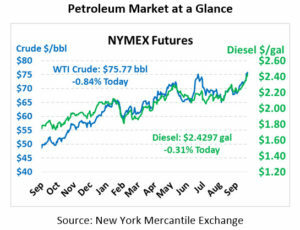 Crude prices once again took a running leap yesterday, leading to a new multi-year high for Brent and WTI as both contracts picked up well over $1/bbl. This morning, prices are giving up a portion of those as traders take their profits and exit the market. WTI Crude is currently trading at $75.77, a loss of 64 cents since yesterday. Fuel prices are also giving up yesterday’s gains. Diesel prices, which rose 3 cents yesterday, are currently trading at $2.4297, a loss of 0.8 cents since yesterday’s close. Gasoline prices, which gained a penny, are at $2.1225, a loss of 1.5 cents. Yesterday’s new heights for crude oil are more perplexing in light of the EIA’s inventory report. Fuel draws were underwhelming from last week, and crude inventories gained a massive 8 million gallons week-over-week. Cushing stocks also picked up 1.7 million barrels, putting it 2.7 million barrels above its annual low from August. In addition to a bearish EIA report, Saudi Arabia and Russia both reaffirmed yesterday that both countries are targeting OPEC oil prices to be $80/bbl – down from the current $83.50 range. In fact, Saudi Arabia has increased their production to 10.7 million barrels per day, up from below 10 MMbpd in the first half of the year and near a record high for the country. With markets ignoring both Saudi Arabia’s increase and the inventory builds, it’s apparent that bullish sentiment is overwhelming the market – begging the question, what will it take to stop the bull?